Intuary, a mobile app startup, recently launched its first app, called Verbally, which is designed to bring speech to those without. Verbally is an augmentative and alternative communication (AAC) solution built for the more than six million people in the U.S. suffering from speech disabilities — caused by Lou Gherig’s Disease, stroke, brain injury, Parkinson’s, cerebral palsy, autism, and more. The app allows users to tap the words they wish to communicate onto the app’s keyboard, or choose from pre-prepared words or phrases, which are then in turn transmitted into audio phrases. The app’s founders, Anil, Gautam Godhwani, along with their cousin Ajay, lost their mother (and aunt) to Lou Gehrig’s Disease in February of this year. She had been a music teacher and singer for 40 years, but in late 2009, her voice began to fail. Seeing the tremendous impact the lack of communication had her, they began investigating solutions on the market. While there are a number of solutions currently available, the touchscreen solutions from large corporations, like Dynavox-Mayer Johnson, cost a minimum of $8K and require at least one month of waiting. Obviously, for those suffering from aggressive illnesses, that wait time is unacceptable. 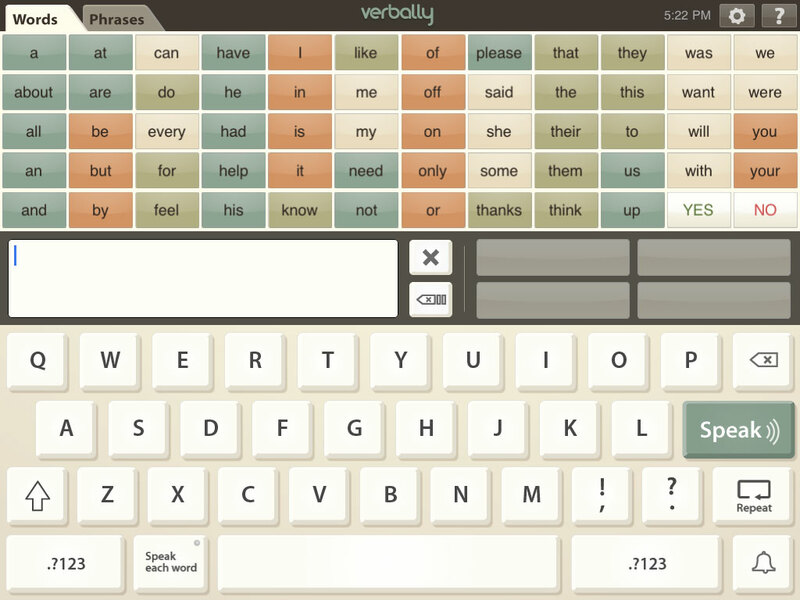 As such, the app offers a full keyboard in which to type the speech the user wishes to communicate, as well as a “Core Words Grid”, which offers over 50 essential words, designed to save users with less mobility 50 percent of the taps required to input sentences. There’s also a “Core Phrases Grid, smart text prediction, customizable keyboard layouts, and choices of various male and female voices — all designed to minimize keystrokes and maximize ease, speed, and choice. Lockheed Martin and McGraw-Hill, and Anil and Gautam Godhwani are board members, active advisors, and investors in Intuary. The brothers, along with Peter Weck, launched Simply Hired, a venture-backed job search site. Verbally has been downloaded 20K+ times since its iTunes launch in March. It’s a great cause, and it’s nice to see entrepreneurs innovating and trying to bring cheap, easy-to-use technology to the disabled.